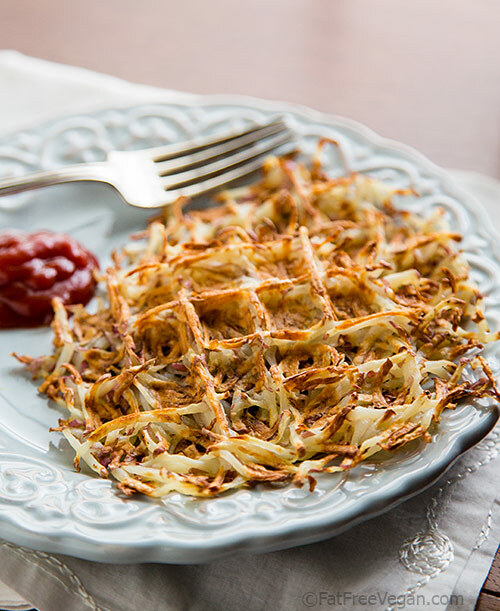 Crispy on the outside, tender on the inside, these waffle iron hash browns contain one ingredient: potatoes! For years, my daughter’s favorite after-school snack was Ore-Ida hash brown potato patties. They were made of shredded potatoes with no oil added, and it was a tight squeeze, but two of them fit in our little Foreman grill (they often came out fused together in one mega-patty). They were a healthy treat for a growing girl with a large appetite, one that she learned to make herself, with a little supervision. But then there came a day when our local grocery stores stopped carrying them, and eventually, I learned, the company stopped making them completely. I hadn’t thought about them in years until I started seeing photos of potatoes cooked on waffle irons in the McDougall Friends group on Facebook. Most of these were whole, pre-cooked potatoes, smashed and browned between the plates of a waffle iron. So I decided to see if I could make shredded hash brown patties using the waffle iron. I did a Google search, of course, but every one of the top search results for “waffle iron hash browns” used oil. I knew from our Ore-Ida experience that they didn’t need oil in order to get crispy on the outside while tender on the inside, so I decided to give a fat-free version a try. And they were great! 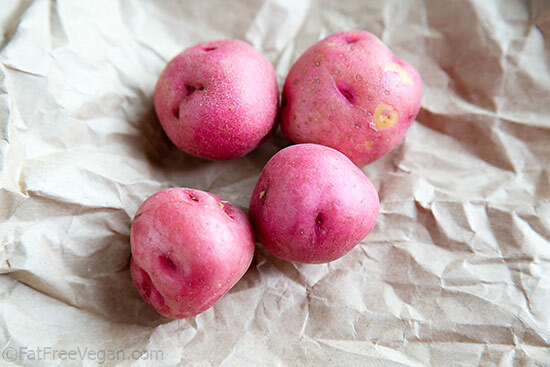 I started with 4 small red potatoes, weighing about 5 ounces total, which I washed well and dried. I began heating my George Foreman Next Grilleration on high. This large Foreman grill has removable plates so that you can switch between a grill set-up and a waffle iron. I used the waffle iron plates and wiped them a few drops of oil on a paper towel (most of the oil stayed on the paper towel). Any waffle iron should do, and if you know for sure that yours won’t stick, you can skip the oiling. I found out the hard way that oiling is necessary for mine. 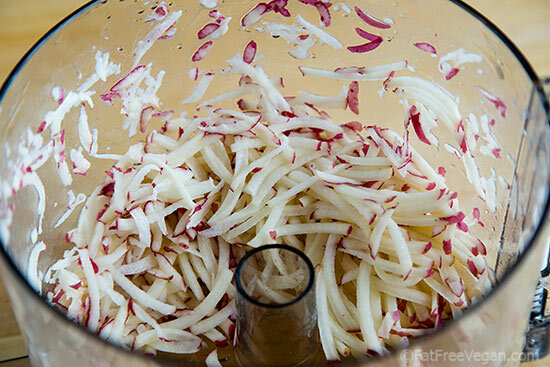 While the waffle iron was heating, I shredded the potatoes in my food processor. It took 5 seconds. I piled the potatoes in two circles on the Foreman’s large waffle iron grill. If you are using a regular waffle iron, just spread them evenly over the whole surface. Close the waffle iron. If yours has a temperature control, turn down the heat to between medium and high. If there’s no temp control, don’t worry about it. Set your timer for 15 minutes. Open the waffle iron slowly, checking to see that the potatoes aren’t sticking to the top. If they aren’t quite brown enough, close the iron and give it a few more minutes. Remove from the grill and serve with your choice of condiments. After I made the first batch, my daughter came in for a sample and pronounced them a winner. Then she quickly made–and devoured–a couple more. Then I tried to get fancy and made a batch with red pepper and red onion–that’s them you see on the grill in the photo above. Unfortunately, that batch was not a success. It took so long to cook on the inside that it burned on the outside; and then to make matters worse, it stuck to the waffle iron (probably because I had forgotten to oil it) so badly that it had to be soaked for an hour to get all the pieces off. If I ever try that again, I will blot the vegetables with a kitchen towel to absorb the excess moisture. And I will oil the grill. This post contains Amazon affiliate links to products I love (and bought with my own money). When you buy something through my links, I receive a commission that helps support this site. Thanks for your purchase! Susan, theses are just the prettiest hash browns I’ve ever seen! I love the imprint of the waffle iron, and they sound delicious. Simple pleasures are the best. Makes me wish I still had a waffle iron! I usually just make mine in a non-stick pan with the cover on, but they don’t look nearly as lovely as these. And thanks for the heads up about the McDougall Friends on facebook. That looks like a fun group to join. ps: loved “this spud’s for you”! These look crispy and super tasty!! Yum, these look great! I do the same thing with the bags of shredded hashbrowns from the grocery store. They are just potatoes and I think some sort of starch to keep them from sticking together in the bag. I don’t use any oil, but my waffle iron is nonstick. My husband and I each have a potato waffle for breakfast everyday. I want to try ones with veggies in them now. Brilliant idea! I think my children would like it too! Thank you for this recipe! It looks soooooo good, I can’t wait to try it! Oh, yum! What a brilliant idea, Susan. Looks like sweet potato latkes are back on the menu this year. So, just to be clear – you didn’t have to blanch the potatoes before you cooked them?! I have always wanted to shred and freeze potatoes to be able to use for hash browns, and in that process everything I’ve read says you need to blanch them first before you freeze them. It was just too much work, so I gave up on the idea. But, if I could make these without having to blanch, that would be so great! I didn’t blanch them, but then, I was cooking them right away, not freezing them. The blanching thing has to do with stopping the enzyme action so they don’t go bad while frozen. Since I was cooking them immediately, that wasn’t an issue. If you wanted to freeze them, you could probably cook them first, freeze them, and then reheat them in an oven later. I can’t promise they would still be crispy, though. “…so I decided to give a fat-free version a try. And they were great!” YES these are great! Gave up years ago on crunchy potato attempts in all forms after going oil free. But, ran right to the kitchen and gave these a try – quick, easy, crispy – fabulous. Used gold potatoes shredded in food processor, then super brief spray of Spectrum high-heat canola oil with first hash batch in the waffle iron, 8 minutes on med-high. Perfection, will be a regular brunch staple.Thank you for your genius, always laced with simplicity. These looks very tasty and crispy. I like the notes you include about what worked for you and what didn’t. I have a non stick waffle iron, so I think that I will give these a whirl. Interesting!! Thank you!!! I am going to try it one day next week!! This recipe hits it out of the park! I have made them several times now since you posted this. My waffle iron hasn’t seen this much of a work out in years! 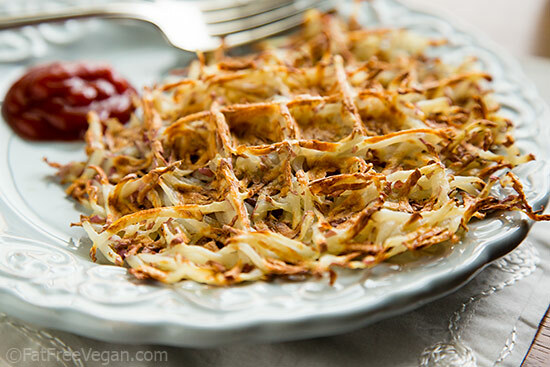 What a great way to make hash browns! Thanks! Thank you for posting this! I made these this morning and they are so good. I made one with just potatoes and one with potatoes and shredded zucchini. I shredded the zucchini, salted it and put it in a colander to get some of the liquid out then squeezed it before mixing it with the potatoes. Hah I love it! It’s so adorable! Waffle irons really are so versatile. Between this and the falafel waffle that was going around, it’s like every meal can be made in an iron. OMG. Susan, I think you just changed my life. These look delicious. Thank you so much for sharing. I just made these last night with scrambled tofu for a breakfast dinner! I think I turned my waffle iron down too far because they took a lot longer; next time I’ll leave it on high or between medium & high. But they turned out GREAT and so easy! I have got to use my George Foreman more. Thanks for the idea! When making hash browns they were suppose to be soaked first after shredding them? No soaking. In fact, you might want to dry off any of the natural moisture that forms when they’re shredded to help them cook faster. omg, this is a *genius* idea! 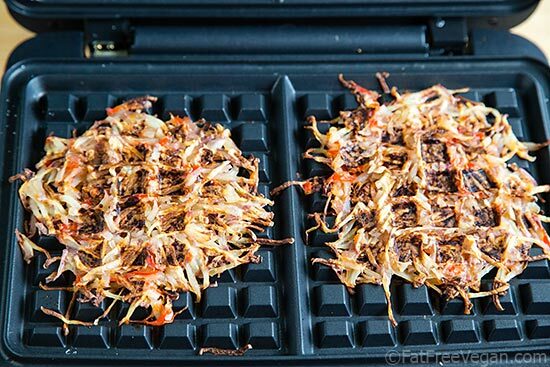 I love hashbrowns but hate how greasy they are – can’t wait to try this out! Susan, I tried this for the first time today, and it was an overwhelming success! So fast, so easy, so tasty and crispy. Thank you so much for sharing. So, not oil-free then, since you are oiling the waffle iron. [sigh] Yes, I oiled the waffle iron because I wanted to actually be able to eat what I had cooked. As I said in the post, if you know for sure that your waffle iron won’t stick, you can skip the TWO DROPS of oil it takes to oil the iron. I’ve made these several times and they never fail. Thank you for sharin! Cool idea to use a waffle iron. Tested it out today and it worked! It did stick a bit much though, even with some coconut oil smudged over the waffle iron with a napkin. Bummer on that, but the hash browns were yummy! Thank you so much for this awesome recipe. I don’t have a waffle maker but do have a pizzelle baker and it worked great. They were super thin and crispy and worked perfectly as the bread for my vegan BLT breakfast sandwiches. Hi there! Thank you for this! I was wondering if I could use the frozen shredded potatoes for this? Would I have to thaw them first? Your thoughts would be much appreciated. I think that frozen potatoes actually work better than fresh. No need to thaw them first. Chef AJ steams those little potatoes until done, then places them in the waffle iron and squashes the lid down. The potato skin keeps them from sticking. 10 mins and they are nicely browned. I tried this and it was a big success. Just wish I could make them faster!! This is really really good! It’s so simple, yet simply delicious! Going to make this this morning. Sure it will work based on our instructions and al the comments. Then on the second batch, will add some squeezed and dry chopped frozen spinach, to the potatoes, with a poached egg for a Florentine-styled breakfast. I loved this! I made it for breakfast, and topped it with mashed avocado. Yum! And the next time I made it, I used the hash browns as the “bread” for my veggie burger.